The Hall of Fame Inductees Dinner is one of the most esteemed events on the football calendar. 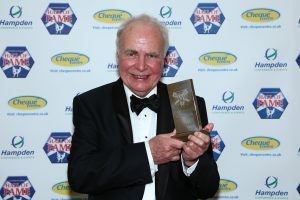 The Scottish Football Museum Hall of Fame Dinner was at The Hilton Hotel, Glasgow Sunday 13th November 2011. A committed captain and born leader, Terry was an integral part of Bobby Robson’s Ipswich team which would win the UEFA Cup and come close to winning the Football League. He was an established England international player, having played at the 1982 and 1986 World Cup Finals, when Graeme Souness brought him north to play for Rangers in July 1986. His arrival along with that of fellow England international Chris Woods perhaps best encapsulates the ‘Souness Revolution’ at Ibrox stadium. The inspirational captain was the driving force on the field which led the Ibrox club to three league championship titles and two Scottish League Cups between 1986 and 1990. Whilst still a Rangers player, Butcher led England to the semi finals of the World Cup in 1990 and afterwards retired from international football after winning an impressive 77 caps (32 of them as a Rangers player). A tenacious midfielder, excelling both in tackling and passing, Pat Crerand started off his career with Duntocher Hibs in 1956 before transferring to boyhood heroes Celtic the following year. After six seasons and 120 games with the Parkhead club, Matt Busby brought him south to Manchester United in 1963. Paddy was an influential presence in a team that boasted Law, Charlton and Best. The Old Trafford side would win the League Championship in 1965 and 1967 and the FA Cup in 1963. The biggest prize of all, the European Cup, was won by United in 1968. Crerand won 16 caps for Scotland, and played in the 2-0 Hampden win over England in 1962. He retired in 1971 having amassed an impressive 401 games with Manchester United, ensuring his place as an Old Trafford legend.